Preheat oven to 190C/ fan oven 170C/ Gas 5. Butter a 28x18cm shallow baking tin and line the base and sides with non-stick baking parchment. Melt the butter with the chocolate in a ‘large’ heatproof bowl over a pan of simmering water. Remove from the heat and stir in the beaten eggs, vanilla extract and sugar. Mix thoroughly. The eggs may look as though they will scramble when first added to the warm chocolate but keep stirring and the mixture should come together. Sift the flour with the cocoa powder over the mixture; first fold then beat-in until evenly incorporated. If using drinking chocolate there may be some sugar granules left after sifting – you can add these to the mixture if you wish. Stir in the chocolate drops and secret ingredient. Spoon the mixture into the tin and spread evenly. Bake in the middle of the oven for about 30 - 35 minutes until set on the surface, but still moist in the middle. Leave to cool in the tin. Don’t worry if the surface cracks – this is normal. 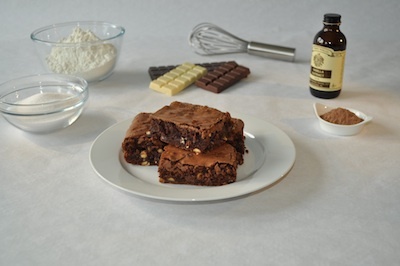 Turn out when completely cold and cut into squares or bars to serve. This site was crafted by Blackdog Media. Site words and photography by Patrick Lennon unless otherwise stated. All content is copyright Glenariff Teahouse unless otherwise stated and may not be reproduced without prior consent from the owners directly. We are open between 10am-5pm, but also have rooms available for private hire, please get in touch to find out more.